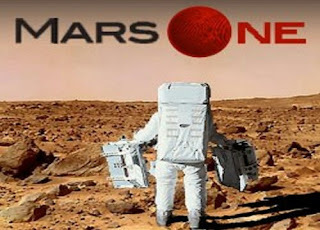 I'd taken a stand not to spill digital ink about Mars One on this blog. That was until two days ago, when the crew of Dubai Eye 103.8 - Alex Hirschi and Tim Elliot - invited Mars One chief Bas Lansdorp to speak on the evening's Drive Live show. I started to shake my head. In 2014, Mars One had pinched some local nerves when the grand mufti of Dubai issued a fatwa (an Islamic ruling) prohibiting Muslims from being volunteers for one-way interplanetary travel. But on the radio show, there was little sign of defeat. With continual praising of the U.A.E and it's forward thinking stance, Mr. Lansdorp's tireless dance for manned one-way trips to Mars might have gotten more than a few listeners, albeit expats, breathless. And those listeners might be forgiven. Afterall, October was the month when NASA hyped a bit about the presence of liquid water on Mars. Ridley Scott had also released The Martian, an entertaining but pseudo-scientific space survivalist movie about a lone astronaut fighting for his life on Mars in the wake of a fairytale dust storm. Mr. Lansdorp wasn't here to merely get cozy with two U.A.E volunteers he'd shortlisted as potential crew members for this future "mission". As it's becoming painfully evident, Mars One is around $15 million short of funding, and it's come to bear that some of it's money making strategies didn't help. An intelligent listener would have recalled that Mr. Lansdorp had recently admitted at a Mars Society face-off with an MIT team (who happily demolished him for the seemingly brazen lack of any feasibility in the $6 billion dollar mission plan) that Mars One doesn't have the financial capability currently to pay any credible scientific group to undertake full-fledged R&D studies. The other cat that jumped out of the bag in the same debate with MIT was that, as of August 2015, the Mars One mission had no fixed project scope, no fixed project time-line and no fixed project cost. It was evident that he had little concrete to offer in the rebuttal of MIT's independent feasibility assessment. Unfortunately, Mr. Lansdorp's weak conclusion that day was : "The Mars One mission is not to do the mission the way as it is exactly described on the website." Sadly, none of his comments from the debate have been posted as an updated disclaimer on the Mars One mission road-map. The "plan" continues to hold that it will send one way manned missions every two years to Mars beginning in 2026. Why, pray, is there a need for Mars One if it's own chief calls into questions the Mars One plan? Might it be wrong now to assume that several hundred patrons might have been duped? I won't be trying to answer how these people justify their return on investment in this case. It's really fuzzy. But now you say hindsight is 20/20, that I'm just another naysayer piggybacking on the MIT study. While I understand any technical product will not sell without a strong commercial proposal, Mars One is awfully lacking in the former. One wonders whether Mr. Lansdorp truly stays awake at night as he fishes out new reasons to try and oversell this plan, particularly in the U.A.E. At this point, I'd like to state two things in my analysis. One, I find interesting, is that the Mars One chief appears to take pleasure in bashing NASA's seemingly slow MARS schedule as the basis for his role in introducing Mars One. To be honest, this can be forgiven on NASA's part for the U.S Congress' space exploration budget cuts in the recent past. NASA must also get a bit of the benefit of doubt because it follows a prudent systems-validation based approach to assessing technical feasibility in putting people and equipment in space. Secondly, Mr. Lansdorp appears to be fixated on a misunderstanding that the Apollo Lunar program had virtually nothing to show technically when Kennedy made his 1961 speech spurring the moon mission. On this basis, he seems to be telling everyone that his Mars One plan deserves a chance as well. Never mind the fact that the Apollo manned moon program had some 12,000 companies, 400,000 people and a backing of $25 billion to make it happen. Never mind the fact that it had no less than 33 flights, 22 of which were unmanned missions to specifically qualify the launch vehicle and spacecraft for manned flight and 4 of the 11 total manned flights were to man-rate the final 7 flights for lunar missions. Also, never mind the facts that NASA had the Saturn rockets going for them and the genius in Wernher Von Braun to provide technical advice during those years. What a lot of people will tend to the forget is that the real need for an Apollo mission to the moon was never really scientific. The strongest impetus for Apollo was the uncompromising competition the Americans had with the Soviets in the space race. The Soviet secrecy around it's own space program never made the Americans comfortable that they were any ahead in this race, even to the very day Apollo 11 launched. Rational or irrational, this conveniently placed call of the Cold War captured hearts and minds and turned a nation on it's heels. In short, yes the moon mission was extremely risky but NASA had a big part of the workable solution already in it's arsenal, which they tested the living daylights out of. They managed out risk. They also had a resounding patriotic call to arms behind the moon endeavor. Both of these are truly lacking in the Mars One plan. Mars One, as it currently stands, calls for taking ordinary people on a never-to-return one way trip to Mars in 2026. Due to the nature of this mission, one might be right to assume that these people are to live dull lives to their deaths as technicians - building, fixing and repairing technology - in a mega experiment that has seldom been tried before. One has to appreciate Bas Lansdorp's energetic parade going around the world flaunting Mars One. But I believe it would be in his best interests to remain truthful about the project realities, re-assess his technical and cost plans and make modifications in the light of technological and procurement readiness. Right now, the Mars One plan rests, at best, on faulty and misleading data. There are the geo-political challenges of an Outer Space Treaty. In this regard, I predict Mr. Lansdorp will have little option but to sooner or later join hands in cooperation with the rest of the world's space agencies. Countries aren't going to be friendly knowing that a single entity might potentially monopolize the exploitation of areas of Mars, which by his own admission on 103.8, is a behavior that cannot be controlled from earth once the mission has landed on the planet. No less important are the unsaid conflicts of interests in demanding the unquestioning service of human volunteers in such a short time and cozying up with investor driven business commitments and schedules. "Stress increased for males while decreasing for females. Males consistently used more avoidant coping while females utilized task coping and social emotional coping. Males also demonstrated higher levels of excitement, tiredness, and loneliness. Simulations situated in environments characterized by prolonged real isolation and environmental challenges appear to provoke true demands for adaptation rather than temporary situational accommodation as has been evidenced by shorter simulations in laboratories or more benign environments". We're yet to take this further and quantify the human capability to cope under long term duress. Hollywood cannot dictate how you will eat , drink, procreate (or whether babies will be mutation free), romance, control criminal behaviors and so on. These have to be tried and tested in environments as close as possible in conditions to Mars. I doubt the leaders of Mars One will not know all this, but the exploration of U.A.E to build an outpost, where temperatures climb to 45 degree C in summer, is rather strange. More to the point, how this plays out in the context of an active fatwa is a mystery. Never to be one taken by hype, I stand cautious of the Mars One adventures. There's a lot of things to make Mars One flop. But there's a huge room to correct mistakes now.